I recieved a most wonderful baby shower given to me by my sisters and friends. First, the amount of food we tend to have at our parties is just delicious. Geometrically shaped cheeses, stringy melted cheese, oozing baked cheese w/ raspberries, did I say cheese and then there are the dips with crackers and tiny toasts that you can also cover with the cheese. Ohh yumm! Next is the generosity of people that encourages me to beome a better person. Had I not been just a tad nervous from sitting in the center of the room with eyes on me I might have actually shed a tear. 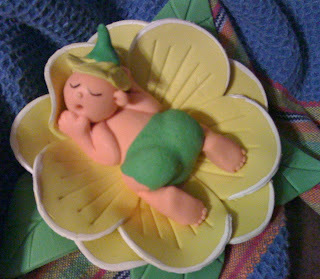 However the apparence of baby things really brings out alot of ohhhhhhhs and aweeeees. Little things are so freaken cute!! And the cool part, which was my friend jenn's idea- the hostest with the mostest- was that all the gifts were to be second hand. Baby stuff is so rarely used to its fullest capacity. And to make the whole thing even better I also recieved several coupons for hot meals after the baby arrives. You can just call me lucky. And I forgot to mention the cakes--did I already use the word delicious!!! I am pretty sure this baby loves sweets. Last I got to bring home all these wonderful gifts and show first timer dad. The amazement on his face was priceless. Even after he tried to eat the cake topper.